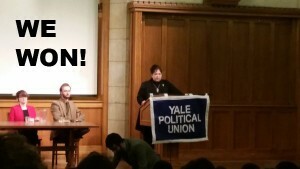 Heated Debate at Yale: Victory for Women and Children! FFL President Serrin M. Foster was invited to make the case in support of the motion. After a long and spirited debate passionately argued by seven political parties — which was live tweeted — a vote was taken. It was another first. And women and children won!! Yes, it is resolved. Pro-woman IS pro-life! Thanks to the Yale Political Union for inviting Ms. Foster to this prestigious event and for warmly welcoming her at a dinner before it began. 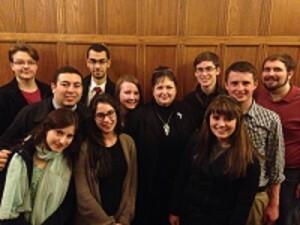 We also wish to express our gratitude to members of Choosing Life at Yale (CLAY) for hosting a gathering after the debate. Serrin was delighted to see some a FFL members who came a great distance for the debate, and a former intern and Yale and CLAY alum, Elena Gonzalez, who also attended. Most importantly Serrin and CLAY members hope that this event, which sparked passionate responses, can result in the support for pregnant women, expectant fathers, parents, and birthmothers who attend or work at Yale. The only mother that anyone could remember graduating from Yale was Maggie Gallagher, who graduated in 1982. To invite Serrin, other dynamic FFL speakers or FFL Pregnancy Resource ForumSM moderators to your campus, contact coordinator@ffloncampus.org today.